Most human beings would be in a black mood after spending 24 hours awake, strapped to a chair, and concentrating hard so as not to die. Not Bertrand Piccard. Gizmodo caught up the man currently flying the Solar Impulse 2 plane from Hawaii to San Francisco, and he sounded downright chipper. 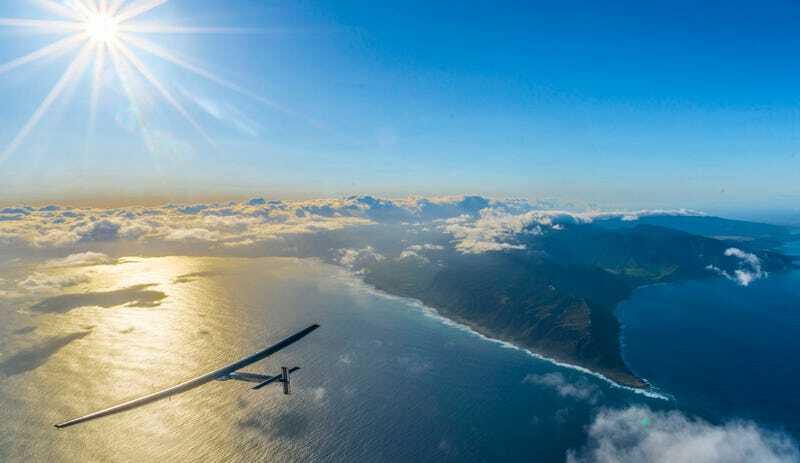 After frying its batteries on a record-breaking 5-day flight from Japan to Hawaii last July, Solar Impulse 2 spent nine months grounded at the Kalaeloa Airport. At long last, after a series of repairs and test flights, it took to the skies again at 6:30 am local time yesterday morning. Piccard has now been in the air for a little over 24 hours, and he’s got another day of flying ahead before he touches down at Moffett Airfield, California. Aside from the occasional 20-minute nap, he must remain vigilant at all times. Once he lands, Piccard hands the reigns Andre Borschberg, who’s piloting the next leg of the solar flier’s round-the-world journey, from California to New York. A single seater, carbon-fiber aircraft with a 72-meter wingspan, Solar Impulse 2 cruises through the sky on no fuel, reaching a leisurely top speed of 34 miles per hour. Its 17,248 solar cells charge four lithium-ion batteries, which in turn drive four electric engines. The expensive, complicated craft is by no means the future of aviation, but it is a powerful demonstration of what can be done with solar technology. Serendipitously enough, Solar Impulse 2's long layover ended right as world leaders were assembling in New York to sign the Paris climate agreement, an unprecedented pledge to wean the the world off fossil fuels this century. Piccard added that this afternoon, he’ll be speaking to some of the people signing the Paris agreement, and plans to give them a gentle reminder that transitioning to clean energy is the only way to prevent catastrophic climate change. His message? Let’s not wait to do it.